Marinate prawns with 1 1/2 tsp chilli powder, 1/2 tsp turmeric powder and salt for 30 minutes. Heat a pan , add the oil and shallow fry the marinated prawns for 3-4 minutes and keep aside. In the same oil, add chopped onions and saute till transparent. Add ginger-garlic paste,green chillies and curry leaves and saute until raw smell disappears. Add chopped tomatoes and saute well until the tomatoes becomes soft. Now add 1 tsp chilli powder, 1/2-1 tsp pepper powder, 1/2 tsp turmeric powder, 1/2 tsp garam masala and salt. Stir fry for few seconds. Add the fried prawns and mix well. Cook for few minutes. Adjust the spice level according to your taste...Switch off and serve hot.. Very delicious n tempting roast..Cute platter too!! Hi Shabbu, this Prawn roast looks good. esp I like the way you displayed in Fish container. and loved all your bowl ( Mango ice Cream one). You have very unique recipes here... glad to join you and keep in touch. Newzeland is my dream destination to visit, esp to witness those Lavender covered mountains. I envy you :-) Happy Blogging and Enjoy! 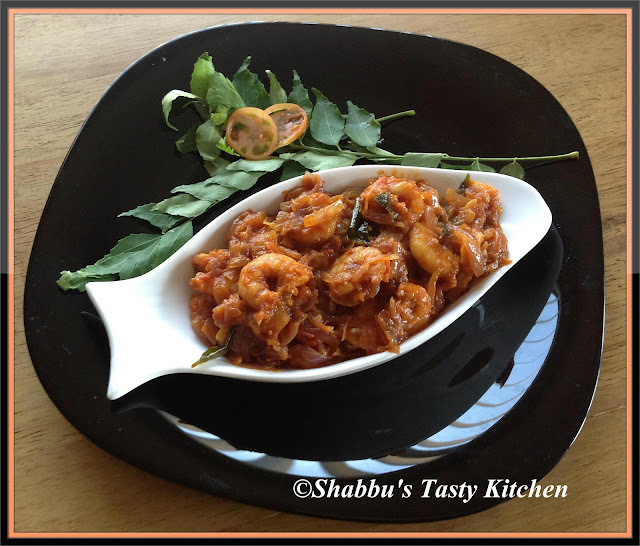 Slurp, mouthwatering here..wat an irresistible prawn roast.